Jenny’s Story and Other Tales takes you from London to New Zealand and from footprints made twenty thousand years ago to the current day. They span bombings in the city, a small town murder and the full range of human emotion, exploring themes of jealousy, regret and loss, while chance also plays a role. Jenny’s Story: Jenny is struggling to cope with a life-changing diagnosis when she is caught up with the bomb explosions in London. 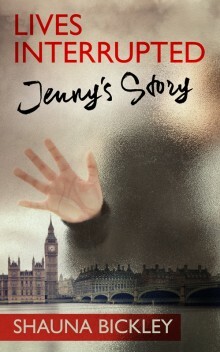 Jenny’s Story was initially going to be part of the novel Lives Interrupted. In Plain Sight: Lexie Wyatt becomes involved in the cold case of an abducted child. A Private Investigation: A young woman working as a receptionist in a Private Investigator’s office finds a dead body. Footprints: The breakdown of a contemporary relationship set against the survival of people who lived 20,000 years ago. In the End: A psychological tale of a young woman attempting to escape a modern monster. Each story has a short introduction outlining the inspiration and background to the tale. The stories vary in length with the longest a little over eighteen thousand words and the shortest around three thousand words (eighteen thousand words is around one-quarter of an average length novel).